Join accessTOG ambassador Debbie North and Charlie Graham-Wood on a beautiful wheel-friendly woodland walk around the grounds of Felbrigg Hall in Norfolk. Felbrigg Hall is a National Trust Property located in the village of Felbrigg near Cromer in Norfolk. It’s a beautiful old hall with a shop, café and walled garden. 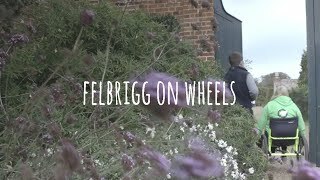 Felbrigg Hall a perfect place for wheelchair users to visit, as the National Trust recently purchased an all-terrain wheelchair that can be hired out for a couple of hours to explore the magnificent woodlands. The woodlands that surround Felbrigg Hall are immense and beautiful at any time of the year. We visited in October and were treated to a magnificent display of autumn colours by the trees. There’s just something quite special to wander amongst the falling leaves, collecting chestnuts that have dropped from the trees. It’s the perfect way to spend an afternoon. Our walk began at the house and led towards the walled garden. Heading through the gate, a good track leads you up a V-shaped path through the woods. There’s a great circular seat at the top of this path, which is the perfect spot to stop and enjoy being amongst the trees and to read the information boards about the history of Felbrigg Hall’s Victory V walk. The route continues on the path, past the old Ice House (now home to several species of bat) and on deeper into the woods. There are plenty of signposts along the trail so enjoy wandering and exploring this ancient woodland – you won’t get lost! Our circular route was about two-and-half miles in length, which eventually took us back to the Orangery, past the front of the hall and into the café for that perfect cup of tea. For this walk I used the DaVinci power wheel, which was ideal for this terrain. However, you can hire an all-terrain wheelchair from the Felbrigg Hall visitor centre and the staff will provide you with a map of all the routes around the estate that are suitable for their chair. Beware in the walled garden – the gravel paths can make it difficult for pushing a manual chair. There are plenty of disabled parking bays close to the hall and those all-important accessible loos!